Bio: Formed in January, 1998, Swingline combined the passion and rhythm of dance and soul music with the energy and ethics of punk rock. Heavily influenced by bands as diverse as The Clash, Primal Scream, the Make-Up, U2, Sizzla and the MC5, the band strove to revitalize the ailing Delaware scene that was such a part of their collective youths. Determined to play only to all-ages crowds, the band organized many of their own shows at local union halls, bringing national touring acts such as the Make-Up and Zen Guerilla to the area, while avoiding the stagnant, cover-band heavy bar scene so prevalent in the first state. The bands only release, the Circa 98 EP, hit stores in the summer of 1999 on their own DIY imprint, First World Imperial Empire. 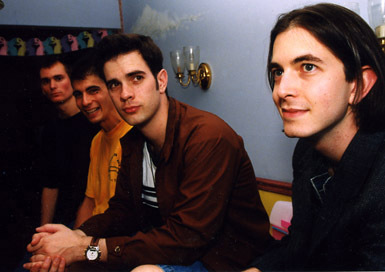 Driven by the powerhouse drumming of Sean Rule and the fluid, melodic bass lines of Zappaterrini, the six songs featured an array of styles and sounds with the guitars switching between Edge-style, delay laden, wah-wah work-outs, to Johnny Marr’s Byrd style riffs to punk heavy noise explosions. The vocals are soulful and passionate, giving life and energy to lyrics ranging from the plight of uneducated workers and corrupted political systems to love, life and romance.